Amish Three Drawer Night Stand - 23"
Add the Amish Three Drawer Night Stand to your bedside so you can have all of the storage you need! This handy bedside table is perfect for anyone who wants a storage piece that they can use to keep important bedside items close by! You can have this beautiful solid wood nightstand handcrafted in soft maple, cherry, walnut, or oak wood. We have a wide variety of finishes that you can choose from to completely match the rest of your bedroom decor! Call us today at 866-272-6773 if you have any questions or would like to have assistance with your order. We have a team of friendly Amish Furniture Specialists who are here to make sure you get exactly what you need! 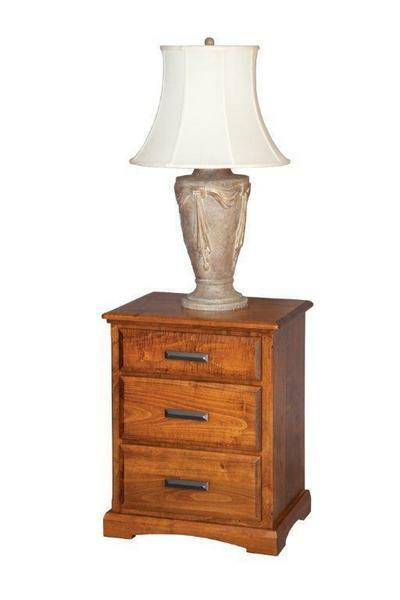 Top Drawer Height: 4 ½"
2 Bottom Drawer Height: 6 ¾"
(Item 1072) Amish Three Drawer Night Stand - 23"